Amid ongoing instability in Guyana’s prisons sparked off by the burning down of the Georgetown maximum security jail one month ago, the Alliance For Change (AFC) on Sunday backed Public Security Minister Khemraj Ramjattan and called for a swift end to jail terms for possession of small amounts of marijuana. “A motion was unanimously approved that the party reposes its full and complete confidence in its chairman, Khemraj Ramjattan, as Minister of Public Security,” the party said at the end of its National Executive Council (NEC) meeting held at Vergenoegen, East Bank Essequibo. Ramjattan has already said he sees no reason why he should resign and that he is politically tough enough to survive in office, despite the fact that he was “embarrassed” by the situation in the prison system. The AFC noted that despite the escape of eight prisoners from the Camp Street jail on July 9, 2017 as the fire raged and 13 others from the swampy Lusignan holding area on July 24, 2017, most of them have been captured. “It was noted that despite the challenges, public order has been maintained and that the recapture of most of the escaped prisoners was done in a relatively short period of time and largely without incident,” the party said. The AFC motion specifically noted the decades long historical and systemic difficulties relating to the public security sector. 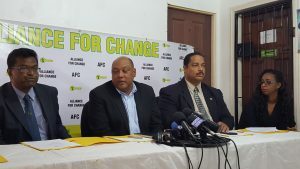 Meanwhile, the AFC’s youth arm, Youths For Change (YFC) made “robust and vigorous representation” to the NEC and the party’s leadership for review of the laws relating to marijuana possession to help ease overcrowding at the country’s jails. “It was agreed by the NEC that modification of the existing laws, will, among other benefits, lend to reduction of the overcrowded prison population. Specifically, YFC urged changes to the law as it relates to mandatory imprisonment for possession of small quantities of marijuana, an overhaul of existing guidelines for sentencing and the granting of bail for narcotics offenses,” the AFC said. Attorney General, Basil Williams is on record as saying that a proposed amendment tabled in the House by AFC parliamentarian, Michael Carrrington first has to pass through Cabinet. Minister of State, Joseph Harmon has also said cannabis laws would not be relaxed.